(CNN) -- Rush Limbaugh brought a cheering crowd to its feet several times Saturday at the Conservative Political Action Conference in Washington as he called on fellow conservatives to take back the country. "We conservatives have not done a good enough job of just laying out basically who we are, because we make the mistake of assuming that people know. What they know is largely incorrect, based on the way we're portrayed in pop culture, in the drive-by media, by the Democrat party," the conservative talk show host told a mostly young crowd of energized supporters. "We want every American to be the best he or she chooses to be. We recognize that we are all individuals. We love and revere our founding documents, the Constitution and the Declaration of Independence. We believe that the preamble of the Constitution contains an inarguable truth, that we are all endowed by our creator with certain inalienable rights, among them life, liberty, freedom -- and the pursuit of happiness," he said, pausing several times for enthusiastic applause. Looking ahead to the 2012 election, Limbaugh said conservatives will have to choose the right candidate to take the country back. Limbaugh's impassioned keynote speech, punctuated by chest-thumping, fist-pumping and chants of "USA" from the crowd, capped off three days of talk at CPAC focusing on rebuilding the Republican Party. "He played to his crowd here," CNN political editor Mark Preston said. "And this crowd is now energized, something we haven't seen from Republicans, certainly not conservatives, since the November election." Limbaugh used his self-described "first national address," which ran more than an hour longer than his allotted 20 minutes, to accuse President Obama of inspiring fear in Americans in order to push a liberal agenda of "big government." "He wants people in fear, angst and crisis, fearing the worst each and every day, because that clears the decks for President Obama and his pals to come in with the answers, which are abject failures, historically shown and demonstrated. Doesn't matter. They'll have control of it when it's all over. And that's what they want," Limbaugh said. "They see these inequalities, these inequities that capitalism produces. How do they try to fix it? Do they try to elevate those at the bottom? No, they try to tear down the people at the top." Limbaugh praised Obama as one of the most gifted politicians he has seen, but said, "It just breaks my heart that he does not use these extraordinary talents and gifts to motivate and inspire the American people to be the best they can be. He's doing just the opposite." Limbaugh also dismissed the notion of bipartisanship as a "false premise" given the diverging views of the Democratic and Republican Parties on a variety of issues, including the recent $787 stimulus package signed by Obama. "What [Democrats] mean is we check our core principles at the door, come in, let them run the show, and then agree with them," he said. Limbaugh's rollicking speech came the day after Obama supporters put out a political ad implying that the conservative radio host has become the de facto head of the Republican Party in the absence of a clear GOP leader. The ad argues that the Republican leadership in Congress is following Limbaugh's lead in opposing the Obama administration's stimulus package. "So who are Republican leaders listening to?" the announcer asks, before the 30-second ad cuts abruptly to footage of Limbaugh saying, "I want him [Obama] to fail." It was paid for by Americans United for Change and the American Federation of State, County and Municipal Employees union, two groups that supported Obama during the election and are advocating for his agenda. Limbaugh doesn't speak for all Republicans or conservatives. Copies of the American Conservative magazine with the headline "How radio wrecks the right" were distributed to CPAC attendees, Preston said. 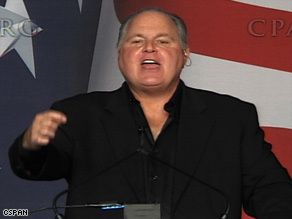 "There is some criticism of Rush Limbaugh. Some people think he is a reactionary," Preston said. "This notion that I want the president to fail, folks, this shows you a sign of the problem we've got," he said. "What is so strange about being honest and saying, I want Barack Obama to fail if his mission is to restructure and reform this country so that capitalism and individual liberty are not its foundation? Why would I want that to succeed?" he said, bringing the crowd once again to its feet. "Did the Democrats want the war in Iraq to fail? Well, they certainly did. And they not only wanted the war in Iraq to fail, they proclaimed it a failure."